Gram Sampark Center in Chandigarh are the single window points for delivery of public services, social welfare schemes, health-care schemes, financial schemes, education and agriculture services to citizens in rural and remote areas of the country. This is the all India network serving to our diverse of the country. Great initiative by government to allow and offer access to the various government schemes and services every citizens of India. 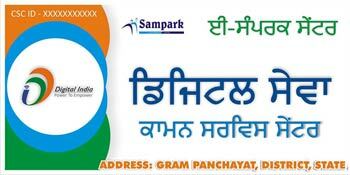 Download Gram Sampark Center Logo, Images, fonts for Chandigarh CSC center. © CSCLocator, All right reserved.